Q: What guidelines do I need to consider for fencing and hardscapes? A: One area the HOA has asked our Management Company's Compliance Monitor to focus on during the winter months is fences and hardscape. More notices of non-compliance with wood fence appearance and/or maintenance standards are going out and we're beginning to see an increase in replacement activity as a result. Approval by the Architectural Review Committee is not required if you're replacing an existing fence with one of substantially similar or identical design, otherwise you must seek approval. All owners are reminded that wood fences and hardscape must adhere to the established standards of the community as described below. Fences must be kept attractive and in good repair and must not be allowed to lean or sag excessively. Promptly repair and/or replace any missing, broken or rotted fence pickets, posts and gates. Fences visible from the street and/or shared wood fences should be constructed of #2 (or higher) grade cedar pickets, #2 (or higher) grade treated southern yellow pine or metal posts and at least two 2x4 railings. Pickets shall be attached vertically without gaps on a string line guide with a minimum of four (4) galvanized nails to prevent streaking. Per City of Austin building code, pickets shall not exceed six (6) feet in height without specific ARC and City of Austin approval. No used materials are allowed. All wood fences visible from the street must have the finished side facing outward. Wood fences on Lot lines common with neighboring Lot lines should be installed according to the Good Neighbor Fence figure as shown. Alternating eight-foot panels of solid pickets and exposed rails are intended to provide a uniform attractive fence to each abutting property. Fences may be stained with earth-toned colors upon prior approval from the Architectural Review Committee. Stain must be periodically maintained due to sprinkler overspray and natural weathering. If a fence is stained, repairs must be similarly stained unless wholly replacing a complete section so that there is no color deviation. The ARC generally allows properties bordering the greenbelt or canyon lands to install wrought-iron or other fence types. All proposed fences must receive prior ARC approval and must be made of sturdy, permanent materials (i.e no barbed wire, chicken wire, etc.) Houses with stone walls around their property are required to maintain those walls at their own expense as they are not owned by the HOA. The HOA does own and maintains the concrete fencing (“Fencecrete” that borders HOA property. Properties with Fencecrete sections not bordering HOA properties must maintain the Fencecrete. The HOA has a Fencecrete contractor who maintains our fences and this contractor will work with individual homeowners if you need repairs to your concrete fence. Masonry planters, borders, retaining walls, etc. are to be kept attractive and in good repair. Defects in mortar joinery such as cracks and gaps are to be promptly repaired. Installation of new borders or beds in any area visible to the public requires prior approval by the Architectural Review Committee. Failure to follow these design requirements and secure the necessary approvals with ARC can result in fines and additional project expense to come into compliance. Properly maintained "Good Neighbor" style fence for sides and back sides of property. Gate post broken. Not structurally sound. 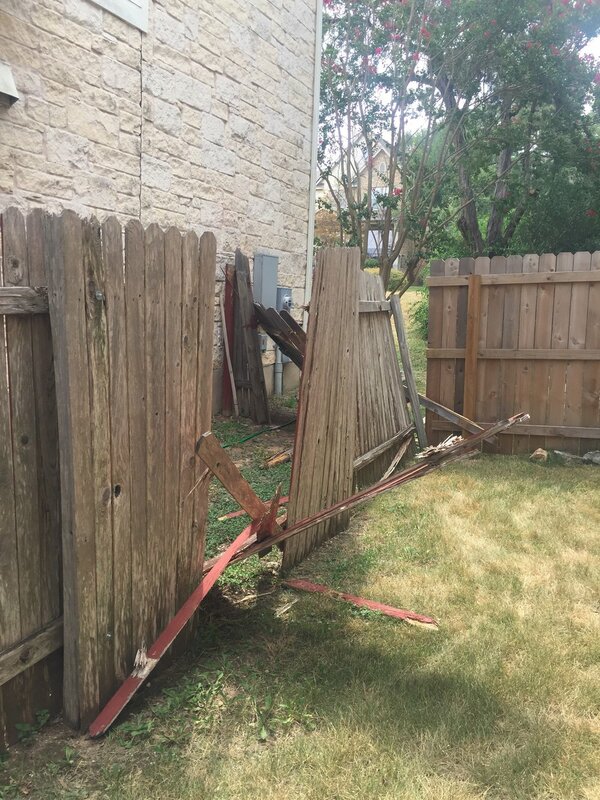 Fence post, rails and pickets broken and not structurally sound. Fence pickets not stained with a neutral color. Added pictures of "Acceptable" and "Unacceptable" fence maintenance.